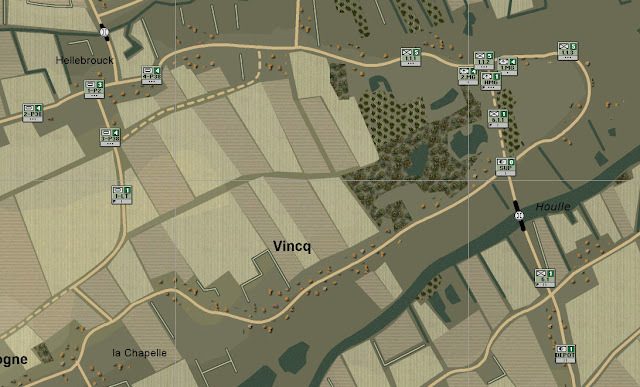 An entirely tactical version (combat between forces at the regiment level and below) of the Command Ops wargame engine is in the works, and it is looking great! A Schutzen company (right) and a light panzer company (left) deployed near the town of Watte. Note the size of the units: platoons and sections (weapons sections). The setting for this first game in the series is France, 1940. Bil Hardenberger and Warren Miron are the project leaders and were kind enough to share screenshots and additional details. This is a work in progress and everything shown here could change. Panther's game engine (Command Ops Battles from the Bulge, Conquest of the Aegean, Highway to the Reich) so far have simulated warfare at the grand-tactical/operational levels. The recipe for success was a game engine with no hexes, continuous time and modeling forces beyond the usual weapon systems and effects. The game engine features a fully dynamic command and control system that simulates order delays, attached and detached units and overburdened HQs. On top of all this wargaming goodness, a logistics system accounts for every gallon of fuel spent and every shell fired. A lot of things going on, yet most of it is automated and ran by a strong artificial intelligence allowing the player to intervene when he finds it adequate. The appeal of a game with a purely tactical scope including all the goodies discussed above is great. But the task of "going tactical" is not trivial. This is not just a matter of throwing smaller units in smaller maps. Almost every aspect of the inner workings of the game engine is being revised, modified and tweaked to simulate combat between smaller forces. The maps will represent smaller chunks of terrain but will be more detailed. The effects of a more detailed terrain model on lines of sight, gunnery and troop movement is being worked on right now. A completely zoomed in map with terrain being shown at a scale of 2 meters per pixel. Plenty of irrigation ditches across the crop fields will certainly hamper infantry movement. Some sort of walls are apparent too between the fields. I wonder if those will count as cover. An intermediate zoom of the same map above, this time at a scale of 8 meters per pixel. Plenty of real estate for combat. 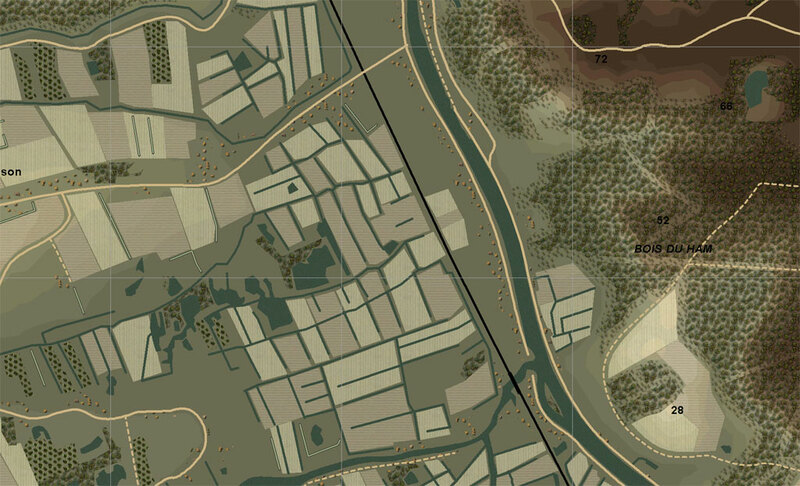 This is how the traditional Command Ops movement grid looks like for the map shown previously. The resolution of this grid is 100 meters and movement speed in shown in gradients of grey (black is fast movement, white is slow movement). This is one of the candidate movement grids for Legends of the Blitzkrieg. With a higher resolution (30 meters in this case), this grid is more adequate than the previous one for simulating movement of smaller forces. Order delays are being adapted for this new game. Units will receive their orders via radio, runners or couriers. The delays will be in general shorter than in Command Ops and will depend on the size of the force receiving the order (issuing an order for a company takes longer than for a platoon) and the amount of radios that the force has (shorter delays for units where all subordinate vehicles have radios). Join a discussion of this game, right here. Awesome, I thought that before, somebody should combine Close Combat with Command ops or COTA, that will be incredible, the great maps of CC (it's a shame the poor IA in those games) with the incredible IA from COTA. This is kind of like that, only a little more larger, but it's going to be really good. Favourite wargame series now does my favourite scale, what more could I want? Set in Stalingrad I suppose (Love to fight the factory district, still really looking forward to this. "Almost every aspect of the inner workings of the game engine is being revised, modified and tweaked to simulate combat between smaller forces." This is not exactly the case... the engine itself will remain unchanged, any change to account for the smaller scale is being handled with creative manipulation of the data. Everything is effected by the data, movement rates, fuel consumption and fuel loads, rates of fire, different order delays based on communications differences, etc. the data is what is being overhauled, not the engine itself. So yes it will be BFTB basically with smaller units, but I don't see that as a bad thing, as the engine, except for a few things that would be nice to have for this scale, handles the smaller scale very well. The movement maps were really interesting to me. I'm working on something similar myself (although much, much simpler) and have been thinking about how to efficiently do movement on a vectorized map. I use raw polygon checks, but perhaps a coarse map like this is simply good enough. "The movement maps were really interesting to me. I'm working on something similar myself (although much, much simpler) and have been thinking about how to efficiently do movement on a vectorized map. 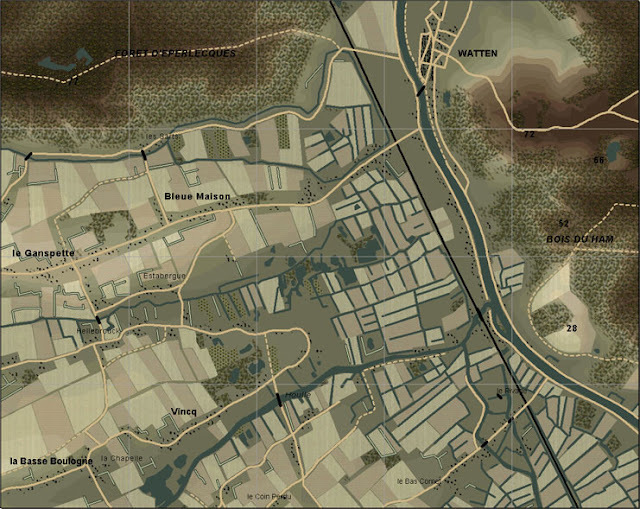 I use raw polygon checks, but perhaps a coarse map like this is simply good enough." There are numbers behind the gray scale movement maps.. for example white = 0% movement (or movement blocked), while black = 100% movement (road, highway, etc. ), the shades of gray are visual representations of the actual numerical value given that particular square. Thanks Bil for the clarification.